One afternoon late in July of 2000, Gord and I decided to kick this huge purple inflated ball I had around in Willistead park, just for something to do. Before too long the ball struck the sharp end of a tree branch and sprang a leak. We tried dressing the wound with some scotch tape back at the house (talk about crude surgery), and then it was back to the park to kick around the dying ball some more. As fate would have it, we ran into Tyson and Joel, two guys we went to high school with but didn’t know at all. Gord and Tyson had exchanged cries of, “Slayer rules!” in the hall a few times. That was about it. We got to talking. Someone lit up a joint. I abstained, as I always did back then. Tyson and Joel asked what we were up to. Gord said we’d been jamming over at my place. We invited them to come back to the house and hear some of our stuff. They took us up on the offer. I played “Rabbits and Leeches” from the just-finished Papa Ghostface album PAPER CHEST HAIR. They seemed to dig it. One thing led to another, and before long a loose jam session was underway. Joel sat down at the drums and grabbed my brushes, Gord and Tyson played acoustic guitar, and I played bass to anchor the low end. For a while we were just making random noise. Then I hit on a bass line, everyone started following me, and we started shaping this thing that would eventually be called Nicotine Eyeballs. A few takes fell apart when Tyson kept urging me to sing and/or record when I was already doing both of those things. I’ve also always felt a bit weird about singing in front of people I don’t know, which made things a little awkward at first. It was a minor setback. Pretty soon I shed my discomfort and we were in the groove. The final, complete take of Nicotine Eyeballs is a bizarre spoken word piece with me shouting my words into the distant microphones recording Tyson’s and Gord’s acoustic guitars. Tyson plays some great, creepy, semi-dissonant things on his guitar there. I’ve always loved Joel’s groan at the beginning when I pause for a moment and he thinks we’ve lost yet another take. There’s a lot of dialogue and between-song banter, and One Piece Is Another features a fun moment where we all start laughing at the end of the song. That one is driven by a riff from Tyson that would soon end up in a Fetal Pulp song (it sounded pretty different in that context, as you can imagine). Disease is the key track, with my slow-motion bass line and hazy, delay-drenched vocal flanked by Gord’s electric guitar runs, Tyson’s acoustic picking, and Joel’s unique drumming style. He loses the beat from time to time on some of these songs, but his playing suits the disjointed nature of the music. All Together is home to one of my favourite lyrics on the album: “And life is like a sausage with no package. There’s no meat, unless you count that garbage you eat — that garbage that taste so sweet.” Every once in a while you just gotta drop some of your s’s. Only Wanna Get Laid is another mostly spoken piece, with some ghostly screaming and moaning in the background from Tyson. My vocal mic grabs some of Joel’s snare hits, and because of the effect I’m using it creates some really cool-sounding distorted drum echoes. It’s kind of funny how even when I was playing bass I still came up with most of the melodic ideas for us to work off of and gave the music harmonic movement, improvising hooks and changes where it felt like they were needed. I guess it was one of those days where my brain and the bass were on good terms. Tyson and I played around with the idea of a country/death metal duet, with me singing and him screaming. Sadly we chose not to record it. I’m not sure why. I remember it sounding pretty hilarious. Joel would never play with us again. He seemed to drop off the face of the earth after this session, popping up at odd places once a year just to remind us he existed, only to vanish into the ether once more. I always liked him. Seemed like a good guy. The last time I ran into him was at a funeral around 2006 or 2007. He told me he still pulled out this CD from time to time and enjoyed the weirdness we created one summer afternoon way back when. None of what we did here really points toward the music I would be making with Gord and Tyson later on. You could stretch a bit and say Nicotine Eyeballs and Only Wanna Get Laid sound like vague prototypes for the angry workouts to come, but this is all role-playing and silliness, with nothing personal or cathartic going on. Even so, it’s all pretty catchy for being improvised out of thin air by four guys who’d never played together before and never would in this configuration again. I’ve always had a soft spot for this album. I decided to take a crack at remixing it in 2010. My first mix wasn’t that bad, but there was some mud I wanted to get rid of. Along the way, I learned I mixed Gord’s acoustic guitar way too low in some songs (he started out playing with the mic very far away), and in bringing his parts up I heard things I didn’t remember ever hearing before. There were some tasty licks tucked away in there. The drums were recorded with a single SM57. I only had a few mics to work with at the time, and we were recording live with no overdubs, so it was the best I could do on the day. Either I got lucky, or Joel knew just how hard to play with the brushes, or both, because for one mic the sound is pretty great. It wipes the floor with the one-mic sound I got on A ROOMFUL OF SEXINESS a year later. Maybe the bleed from the acoustic guitar mics helped a little too. All I really did for the remix was tighten some things up and try to bring more clarity to the mix. So the acoustic guitars are crisper, the electric guitar is easier on the ears, my bass comes through a lot better without bringing any mud with it, and in general everything sounds more upfront and has more punch. In other words, it’s about as good as it’s ever going to get. I had a tough time coming up with a band name and an album title. 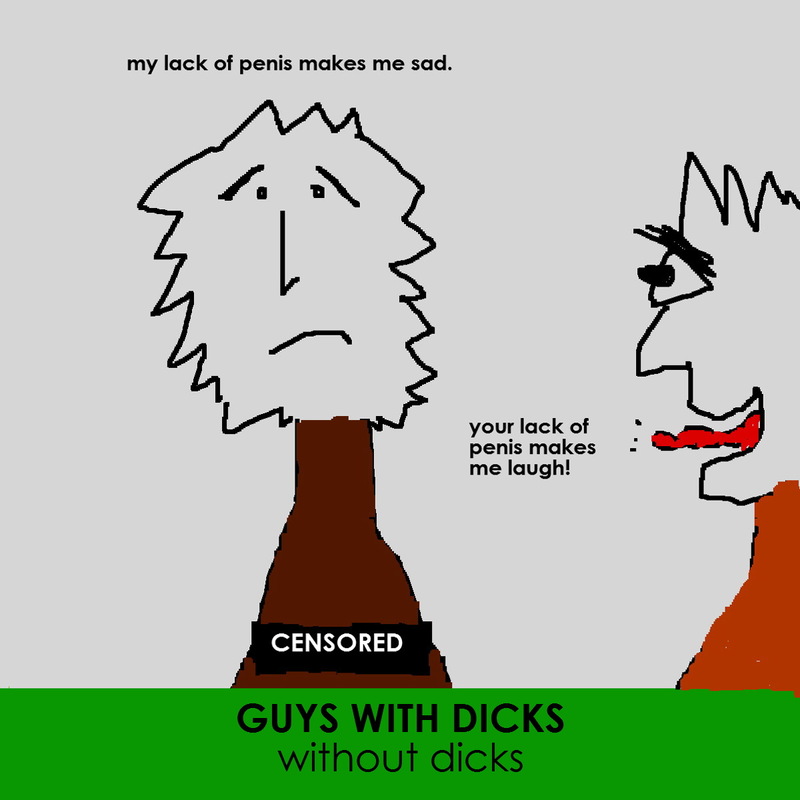 I settled on Guys with Dicks and WITHOUT DICKS as kind of a lame joke (other ideas included “Fast Pope Blues”, “The Stupid Windows”, and “Juju Ramona Ball” — the last of which would get some eventual use as a song title). I didn’t think we’d ever play together again, so it didn’t seem like a big deal either way. When I’m wrong, I’m really wrong.